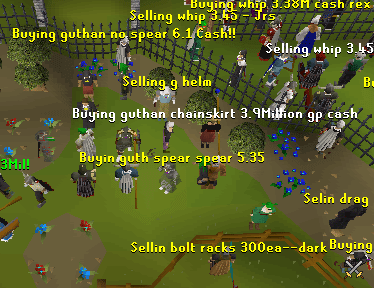 Confused about where to buy something in the place called World 2? If so, then this is the guide for you. 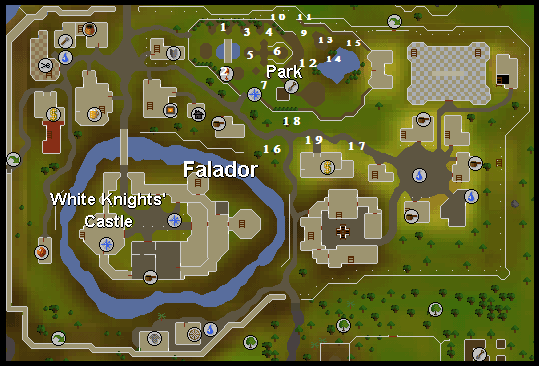 It will tell you what you can buy in each of the three main trading locations: Falador, Seers' Village and Edgeville. With the introduction of themed worlds in RuneScape, this guide appears to be outdated. This content serves only as a historical reference. 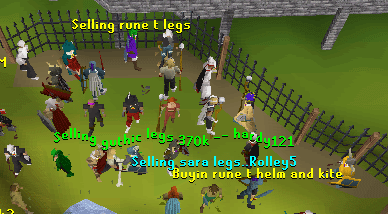 Falador Park World 2 is a place that many people will do anything to keep away from. 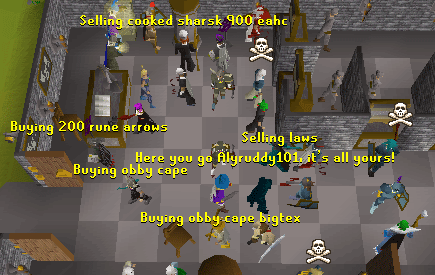 It is the home of merchants and occasionally innocent players will appear as well. Almost anything you want can be found here. Some may call it the home of spam, some may call it heaven. Whatever your feeling is, it's here to stay. The map above has numbers on it. Each number is in the location that an item or group of items is sold. The following text and pictures will explain what is sold in each location. Located at Number One is the Dharok Barrows set. There are four pieces to the set and it is often called "dh". 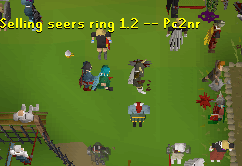 Located at Number Two is the Torag Barrows set. There are four pieces to the set and it is often called "t". Located at Number Three is the Verac Barrows set. There are four pieces to the set and is found on either side of the Dharok's set. Located at Number Four is the Guthan Barrows Set. There are four pieces to the set and it is the most expensive Barrows set because you can heal with it. It is sometimes called "guth" or "g". Located at Number Five is the Ahrim's Barrows set. Once again it comprises of four pieces, but the fourth piece (the Staff) isn't traded as much as the robes because it is often bought for looks. 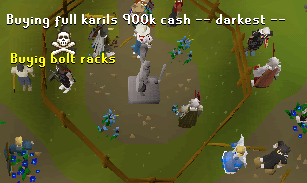 Located at Number Six is the Karil's Barrows Set. It isn't traded very much, but if you do want to buy it you can find it traded near the statue in the middle of the park. Located at Number Seven is the place that the rings dropped by the King Dagannoths are traded. Located at Number Eight is where the Dragon Square Shield is traded. It is called a "d sq" or a "d ". If you are lucky you may also be able to get a bargain on a Dragon Shield Left Half here. Located at Number Nine is the world famous Abyssal Whip. It is traded just round the fence from the Dragon Square Shield and is often called a "whip". This is where the money changes hands. Different kinds of Party Hats or "phats" are traded here. Don't try buying anything here unless you have a LOT of money. Number Eleven is the home of the coveted Dragon Chainmail. To get to here you must go past where the Abyssal Whips and Party Hats are traded and then if you are lucky somebody will be trying to sell a Dragon Chainmail. Number Twelve is where the Ranger Boots and Robin Hood Hat are traded either individually or together. The Robin Hood Hat is called a "robin" and the two items sold together is called a "ranger set". People only sell these very occasionally so if there is somebody selling one of these and you want them then you are lucky. 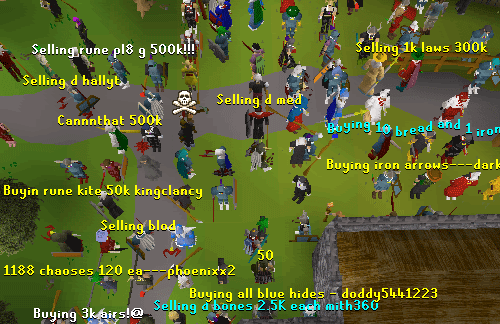 If you want to buy either of them you will probably have better luck on the RuneScape forums. Number Thirteen is where the less expensive discontinued items are traded. The items sold here are things like Halloween Masks, Santa Hats, Pumpkins and Easter Eggs. Taking up a large area of the Park is Number Fourteen. Here the rest of the Dragon Armour is sold. The rest of the Dragon Armour is the Dragon Legs, Skirt and Helmet. The Legs are called "d legs", the Skirt is called "d skirt" and the Helmet it called "d med". Number Fifteen is in the East part of the Park and is where Treasure Trail Armour is traded. This kind of armour includes Gilded, (t) and (g) Armour. It is just ordinary Armour with extra colors on, but is rare so it costs more. Number Sixteen is home to the Dwarf Cannon and Cannonballs. The Dwarf Cannon is called a "cannon" and the Cannonballs are sometimes called "balls" or "cballs." 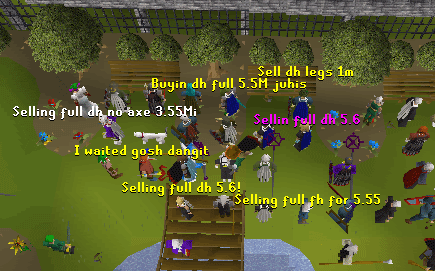 Number Seventeen is where anything to do with Herblore is sold. If you want that Potion or Herb for your latest Quest then this is where they are sold. Number Eighteen is where the things any normal person would want can be found. 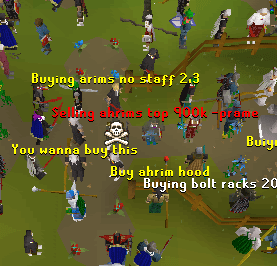 Rune Armour, Mystic Armour, Glory Amulets, Rings of Wealth and Dragon Weapons are all sold here. Number Nineteen is where almost anything and everything is sold. If you want Runes, Dragon Bones, Dragonhides or Arrows they can all be found here. Number Twenty is where Obsidian Armour and sometimes Weapons are sold. Normally you can only find people selling Obsidian Capes and Shields here, but occasionally people will be selling some of the weapons. Obsidian is often shortened to "obby". 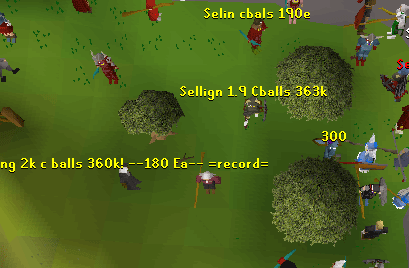 There are a couple of places that people trade around Seers' Village. The first is at the Camelot Teleport spot. 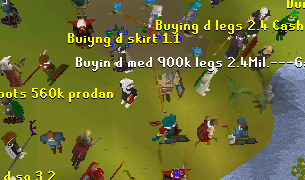 People are buying Law Runes nearly all the time because of the fast xp available by Teleporting. The other place that people will buy and sell things in or around Seers' Village. 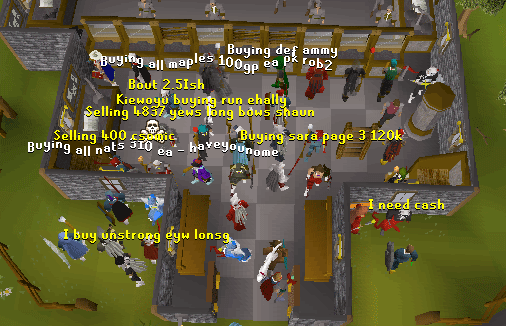 The most common things to be bought and sold here are Logs, Flax, Bowstrings and Nature Runes because Seers' Village is the home of Fletching. 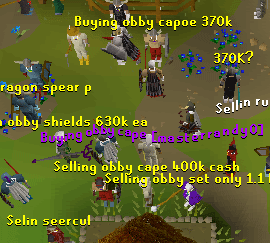 Edgeville is located just beside the Wilderness, so the things bought and sold here are all used in the Wilderness. 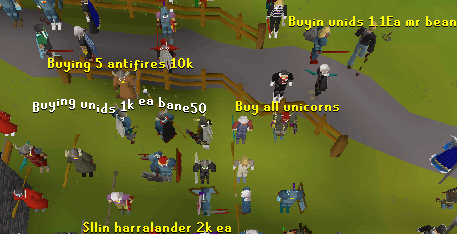 The most common items traded here are Sharks, Rune Arrows, Dragon Weapons and Super Sets. A Super Set includes a Super Attack, Strength and Defence Potion.